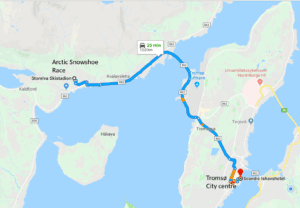 From the city center of Tromsø (bus stop Sjøgata S4) you take bus number 42 Eidkjosen towards Kvaløya. 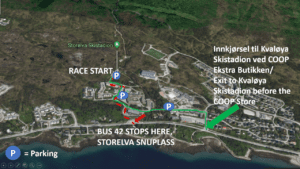 You can ask the bus driver to drop you of at Storelva Snuplass. From there it is only a 5-minute walk to the start of the race. We will put up signs from the busstation so it will be easy to find.